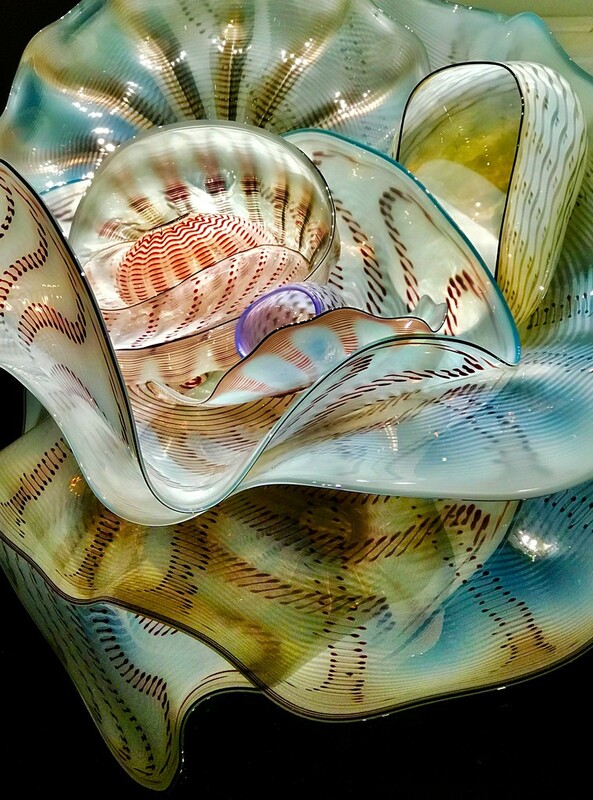 This is another Dale Chihuly Seaform art piece from The Catalina Island Museum. Chihuly’s unique ability to shape molten glass creates a series of works that evoke seashells and other underwater creatures. They were all so stunning, it was hard to choose. I loved the reflection off the table. This totally looked like sea shells and sea forms when I first saw the pic. Gorgeous to see these colors used as well. I am used to seeing more primary colors in his work. A beautiful capture, CC. I love the table reflection, too. Well done! Magical capture of shapes, colours and patterns. @rjb71 Richard...his work in incredible! Dale Chihuly is from Tacoma, Washington USA but has done installations all over the world with chandeliers, flowers, seaforms, millefiori and much more...plus he paints too. Thank you! Many thanks! I could stare at his work all day long! It is so beautiful to see in person. @tonygig @lyndamcg Thank you! I love his artwork...especially in person! @yorkshirekiwi @yogiw Thank you! The reflection of his artwork on the black table tops were genius! There was a second room with pieces on white tables and though the pieces were just as gorgeous, after seeing this type of lighting and reflection, it didn't have the same impact. Beautiful glass and a great capture and reflection. Chihuly is a genius! Fav. This is a gorgeous glass sculpture. Love the lighting and composition. I can't get enough of Mr. Chihuly's work. I am completely enthralled and mesmerized. I wish I could afford a piece. A wonderful image of his work.